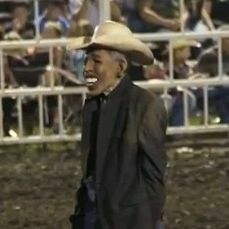 After a rodeo clown in Missouri donned an Obama mask for a routine whose core concept was that a bull ought to trample the president, the Missouri State Fair banned the clown for life for his “unconscionable stunt,” saying it was “inappropriate and not in keeping with the Fair’s standards.” In doing so, it created a great victim for some conservative, theatrical types to rally around. Welcome to the latest in the you-didn’t-build-that-empty-chair-upside-down-American-flag train of right-wing memery: the Obama rodeo clown as a hero for liberty. Unsurprisingly, Glenn Beck is at the forefront of this, declaring on his radio show Wednesday, “today I officially declare myself a rodeo clown. Today I officially declare that we are all rodeo clowns.” On Twitter, calls have been circulating for a boycott of the Missouri State Fair. A Facebook page supporting one of the clowns, Tuffy Gessling, has 38,436 likes. Gessling, who said he never intended anything racist by the stunt, is one of three people who participated in it, but he didn’t wear the actual mask, NPR reports. Perhaps if the Missouri clown is busy Stockman could see about booking Beck himself, who previously claimed to have some expertise in the field.